I'm running Mojave on my MacBook Pro. IT-support installed VMWare Fusion but I can't expand the VMware Fusion window to the full width of my laptop. It's really frustrating. Any ideas on how to fix? I saw this for Ubuntu but that's not my OS. Additionally - is there a setting to enable my windows VM to run full screen on macOS Mojave? You need to install VMware tools inside the Windows virtual machine to be to resize the resolution of the virtual machine from the host. That will enable you to resize the window to fit the width of your display, as well as being able to enable "Resize to Fit" so that when you resize the size of the window, the virtual display resolution within the virtual machine changes as well. You can install VMware Tools by opening the menu titled "Virtual Machine" and choosing "Install VMware Tools". Without VMware Tools you'll need to change the resolution of the virtual machine from within the virtual machine itself. On Windows you'll often be able to do so by right-clicking the Desktop and selecting Properties, and then select a display resolution that matches the width of your display. It is not that convenient. If you want to run the virtual machine in full screen, i.e. not in a window, you can do so by opening the menu titled "View" and choosing "Full Screen". Or as a keyboard shortcut, press Ctrl-Cmd-F.
Not the answer you're looking for? Browse other questions tagged macos mojave vmware . Why do I lose my USB speakers after reconnecting with VMWare Fusion 3 running? 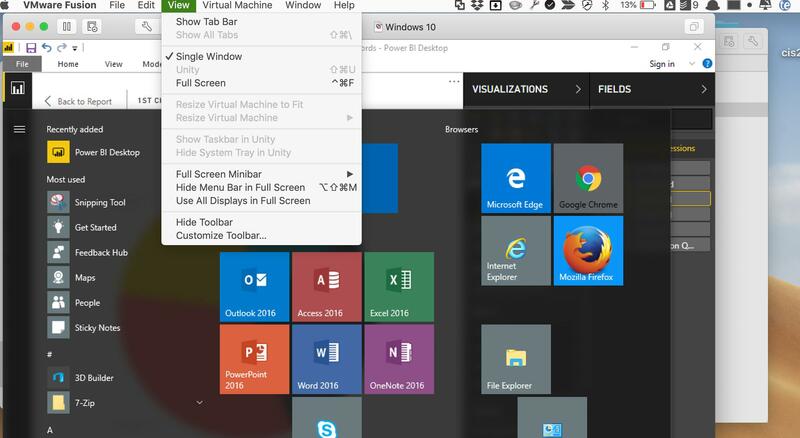 How to auto-adjust the resolution of a Windows 7 VM using VMware Fusion?